Make the element 'none' even though this are used by the kekkei genkai. Next, are these meant to be personal jutsu or ones that are universal that other Kaguya member's could learn? In the second one, make sure the description states that it uses the Kaguya's bone manipulation. And I'd say the second one is probably C-rank, in my opinion. 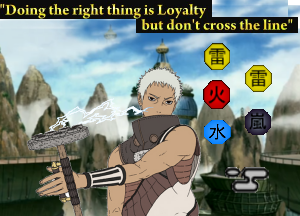 They were intended as personal jutsu, however given the general application of the clan technique I think the Kireaji Kotsu No Jutsu :: Bone-edge should be general. I think it would make sense that while the clan seems focus in close combat (as it's jutsu tree implies) there would be range techs developed. Though the second one, the Hiryuu Kireaji Kotsu No Jutsu :: Flying Dragon Bone-edge, is a personal one. The second custom has benn reworded to "Like its predecessor, Kaguya manipulated bone is..."
Alright, then once these are approved the D-rank will go under the clan index page as a technique. You'll have to train for both of these, just remember that. Yep, I have a post on standby for "D".